Among the martial dances some are not much stylized and their martial character is obvious. Some are so stylized that careful analysis only reveals their martial character. One of the martial dance of former kind is Thang-Ta of Manipur. Thang means sword and Ta means spear. The dance is performed with other weapons also. It is basically a mock fight of attack and defense. Traditionally various kinds of martial dances are performed on the concluding day of the Lai Haroba festival. The tradition is very ancient and its reference is found in many myths peculiar to Manipur. The myth connected with the martial crafts is as follows: A progeny of Teen Sidaba, who is the progenitor of the ancient Manipuri race called Mata, was lost having been caught in the ancient fish trap of Thongnang and the various parts of his body became different kinds of sword, knives, other weapons and tools. Teen Sidaba is an aspect of Pakhangba, the God. When Pakhangba springs into the core of the sun and remains there inside the golden casket, he is known as Teen Sidaba. It is Pakhangba who originated the Thang Ta. 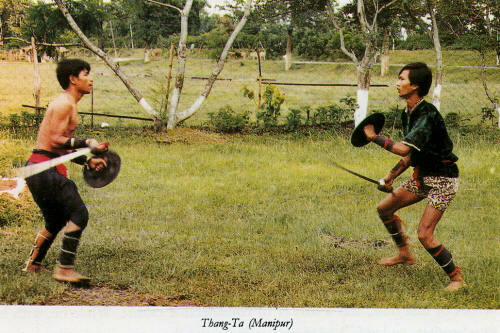 There are two kinds of swordplay : the make-believe kind is called Leiteng Thang, and the actual fight is called Yanna Thang. Generally, the former kind is performed as dance.